Who: Jo Garner, 50, of Germantown; mortgage originator at Evolve Bank and Trust; host for WREC-AM 600’s “Real Estate Mortgage Shoppe”; facilitator of the networking group Talk Shoppe. Issues: Wanted to lose weight, and wanted a more professional look since she is in the public more and more with her business ventures. Hair fix: Certified stylist Bob Turner of Gould’s Spa and Salon in Collierville took on creating an easy-care style for Garner. To illuminate her natural color, he applied a clear glaze for a healthy shine. Garner’s new style had to be able to be styled without any tools (she admitted to Turner she didn’t even own a blow dryer). Turner created a style that was shorter in the back, and was textured throughout so her fine hair would be able to hold its own style. He used shears and a razor along the neckline and outer edges for softness. Turner used B&B Thickening Full Form Mousse while Garner’s hair was wet; then on dry hair he used B&B Thickening Crème Contour and styled with his fingers. Beauty fix: I used Your True Colours makeup, starting with moisturizer, followed by primer. Over her entire face, I used Light Collage Mineral Pressed Foundation, mostly for ease of use. Charcoal mineral shadow was applied along the upper lash line, Wheat was used over the entire lid after the Charcoal, for ease of blending. Brown loose powder mineral eyeliner was applied along the lower lash line with an angled brush and sealant. Bob Turner applied hair color to Garner’s eyebrows to match her natural hair color and define her eyes. To complement Garner’s Warm Golden skin tone, Studio Gear Natural Peach cream to powder blush was lightly applied on the apple of the cheeks, and Playful lipstick was used, followed by Birthday Suit lip gloss. 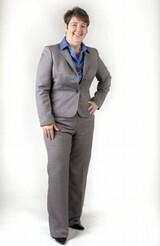 Fashion fix: Vera Terrell, certified retail fashion consultant with Fashion Academy at Dillard’s Oak Court, fit Garner in her new size and new look — a Kasper separates pantsuit in gray, with a slight peplum jacket to enhance Garner’s waistline, and a fitted blue shirt. Gianni Bini kitten-heeled pointed-toe pumps in navy blue were chosen. To accent her true corporate look, pieces by 7 Lucky Stones, found on Facebook, were introduced. Labradorite beaded necklace with a matte gold chain and a bamboo jasper pendant on a brass chain enhanced by copper freshwater pearls accented with a labradorite and gray jade bracelet gave Garner just the right amount of accessories, since she normally doesn’t even wear a watch or earrings. Fitness fix: Rita Connally, personal trainer at the Schilling Farms YMCA in Collierville, worked with Garner for just over three months. Connally stepped in to upgrade Garner’s initial regimen. Connally pushed Garner to her limits, then served as her facilitator and cheerleader when needed, continually challenging her as she advanced. Garner was instructed in general nutrition, healthful snacks, and options for food that would “fill her up.” The result: Garner lost inches and 25 pounds and added muscle. Garner went from a size 16 to a size 12 (a 12 is a little big, but a 10 is still a little tight). Score card: “I love it. Thank you.” Garner said over and over. “My hair is amazing, and I can do this.” Schilling Farms YMCA gave Garner the three months of use of the Y for free, (And she is keeping up the membership to stay on top of her fitness, and keeping Connally as her personal trainer. ), Fashion Academy gave her her colour palette, Dillard’s gave her 40 percent off on the clothes, which she purchased.